Click on Home Loan EMI payment under the Home Loan tab. Click on ‘I Accept’ button in the disclaimer to proceed. The screen displays the steps for making the payment, click next after viewing the steps. On clicking ‘Next’, you will be re-directed to a form where you can enter Home Loan details and payment details. Enter all details ‘step by step’ to complete the transaction. Please note Online Home Loan EMI Payment facility is available only between 5th and 24th of the month. In the event you are unable to make your Home Loan EMI Payment, you can try the same again after 24 hours. If you still experience an issue, you can contact the Citiphone Helpline for assistance. Payment through cheque - Submit a cheque or draft payable at any Citibank branch favoring "Citibank loan number _______". Note: For cash payments equal to or exceeding INR 50,000, please provide a copy of your PAN card. For cash payments equal to or exceeding INR 4,00,000, please carry details/information regarding the source of funds along with a copy of your PAN card. For cash payments equal to or exceeding INR 10,00,000, please carry documentary proof of the source of funds along with a copy of your PAN card. For Citi loans, all repayment instructions will be presented on the first working day of the month. The same will be credited to the loan account upon receipt of cleared funds from the other bank, a process which takes 3-4 working days. However, the credit will be provided to your loan account with a value date i.e. on the day your bank account is debited. For Loans acquired from erstwhile Citifinancial (now known as Citicorp Finance India Ltd), all repayment instructions will be presented on the 5th of the every month. The same will be credited to the loan account upon receipt of clear funds from the other bank, a process which takes 3-4 working days. However, the credit will be provided to your loan account with a value date i.e. on the day your bank account is debited. In case of SI, the amount will be credited to your loan account on the same day. You can change the mode of payment or repayment bank details maintained on your loan account. To change the repayment bank details or to register for NACH or to maintain a Standing Instruction from your Citibank savings account, please click here. Please note that if the payment instruction is received after 20th of the month, the EMI for the subsequent month will be processed as per the existing instruction maintained for the loan. Please fill in the below documents and send it to our mail room. The same will be maintained in our records subject to scrutiny of the documents. You can download the NACH forms by clicking on the below link https://www.online.citibank.co.in/customerservice/download_forms.htm. Your duly filled and signed NACH mandate and cancelled cheque should reach us before the 20th of the particular month, for us to maintain the EMI the subsequent month. Please send the filled in SI instruction form to our mail room. The same will be maintained in our records subject to scrutinisation of the document. The excess EMI paid will be refunded to you. You can contact CitiPhone and place a request for refund of the excess payment made. The amount will be refunded through NEFT (or) demand draft (or) as credit to your Citibank savings account. Alternatively, you may also request to adjust the same towards the principal outstanding on your loan account. In the event of a part payment made towards your loan account or a reduction in the rate of interest, Citibank allows you to revise the EMI amount based on internal checks, subject to our credit parameters. We request you to kindly contact our Citiphone helpline number and our officer will guide you with the revised EMI amount. Please note that the EMI will be revised basis the pending principal, current rate of interest and the remaining tenure. You may send us a revised repayment instruction in order to maintain the same in your loan account. Basis internal check, the mandate will be marked discrepant for reasons such as drawer signature differing, amount in words and figure differing or data mismatch with the loan account. We will send the details of the discrepancy to your mailing address registered in our records. We request you to then revert with a fresh mandate, with the correct information, for our records. Please click here to download the NACH form. For any assistance required in filling up the mandate, please contact our CitiPhone helpline. Our officers will be glad to assist you. Please fill in the NACH form with the below details, as applicable to your loan account. 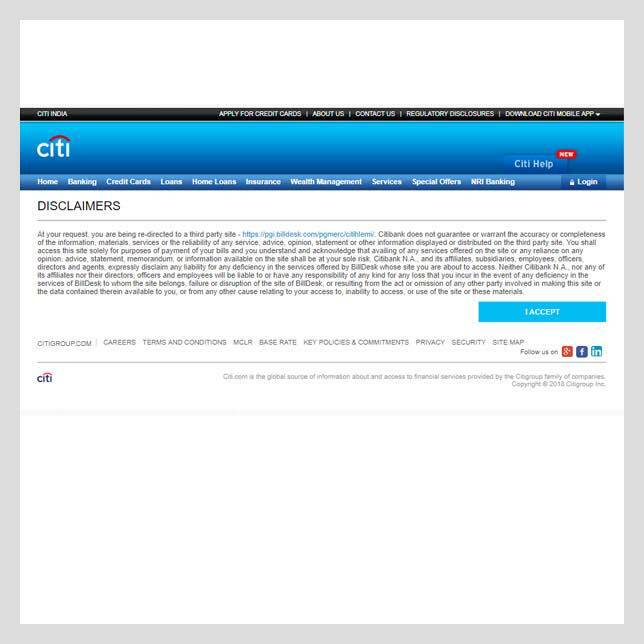 Authorize: Please write it as Citibank N.A. Amount in rupees: EMI amount in words. Phone No:	Customers’ mobile no. or landline no. with STD code. Two copies of duly filled mandate should be sent to the bank. Mandate can accommodate only three authorized signatories. In cases of more than three signatories associated to an account, please inform your bank to process the mandate with only three signatures. In case the loan is availed in the name of a company, then the company seal should be affixed in the mandates. The current interest rate offered by Citi is available on our website. Please click here (https://www.online.citibank.co.in/products-services/loans/pdfs/Pricing-Grid.htm)/(https://www.online.citibank.co.in/products-services/loans/faq.htm) to view the same. If there is a change in Citibank Mortgage Prime rate/Base rate/Marginal Cost of Lending based lending rate (MCLR)/Treasury Bill benchmark linked Lending Rate (TBLR), then rate of interest on the loan will vary at specified intervals depending upon the variant chosen at the time of signing the loan agreement. If a change is made to the interest rate, an official communication regarding the same is sent to your mailing address. We are happy to inform you that migration of your loan to MCLR/TBLR can be done at no additional cost. Please contact our CitiPhone helpline. 1. Login to www.citibank.co.in using your User Id and Internet Password (IPIN). 2. On logging in to your account, click on "view account summary". 3. Select the account number of your choice. 4. The transaction details will be displayed at the bottom of the page. 5. To view other transactions click on "view transaction" and follow the procedure displayed. 6. To download, click on "download account details". 7. The details will get downloaded on to an excel sheet. 1. Please click on the link “View loan Certificates” in the left navigator. 2. Then click on the link “Recent Financial Year link” and “Current Financial year link”. 3. Then you can click on the link “Interest or Principal Certificate” to view the details. 4. To download click on "download account details". The mortgage loan amount will be disbursed as per the disbursal request received from the customer. The initial request can be made to our officer at the time of signing the loan account. You may place subsequent requests for disbursal through Citibank Online. 1. 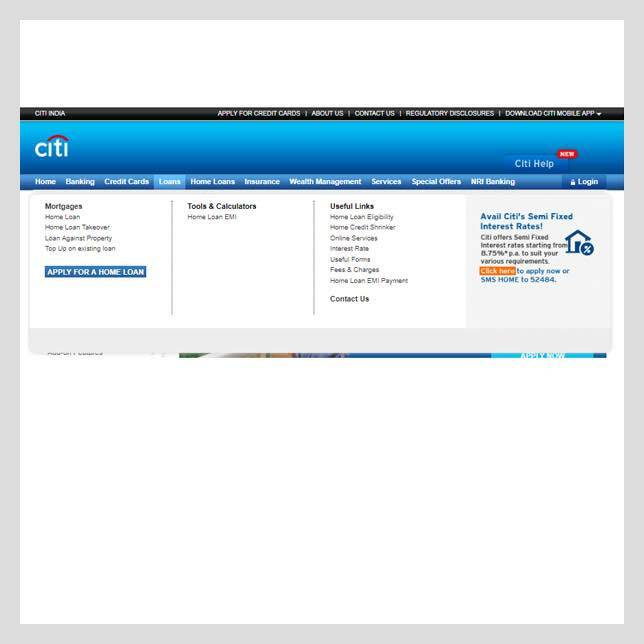 Login to Citibank Online. 2. Click ‘Home loan’ tab. 3. Select “Request loan disbursal” in the left navigation pane and enter the requisite details. You will receive an intimation for the same once it is processed. 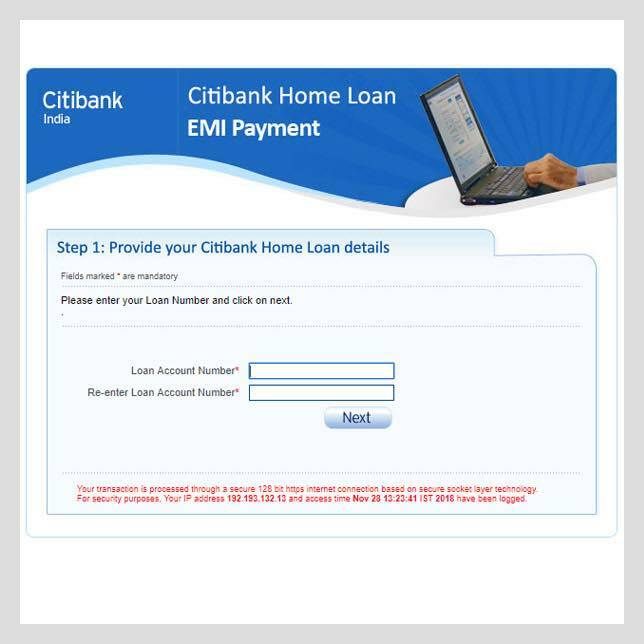 Step 1:	Login to Citibank Online (www.citibank.com/india) by using your User Name and IPIN. Access quick links on the top right panel and click on 'View/Edit'. Step 2:	Choose your Account/Relationship Number. Click on 'Generate OAC*' and authorize with OAC received on your registered mobile number. Step 3:	Edit your contact details (Mobile Number/E-mail ID/Address). Click on 'Confirm' to authorize changes. You may send a copy of your PAN card along with your instruction to update your PAN number to our mail room address. Alternately, you may also visit our branch to get your Pan number updated in our records. Please refer to EMI payment for Home Loan to know the modes of payment. Online transfer will take 72 working hours to reflect in your loan account. In case of cheque payment, the same will be credited to your loan within 4-5 working days, subject to realization of funds. Partial pre-payment will reduce the principal outstanding on the loan account and helps you complete the loan faster. If you wish to reduce the EMI amount, you may contact our Citiphone helpline and our officer will share the revised EMI. Please note that the EMI will be revised basis the pending principal, current rate of interest and the remaining sanctioned tenure. You may send us a revised repayment instruction in order to maintain the same in your loan account. Please click here to download the NACH/SI mandate. The closure of your loan account shall happen once the loan tenure has elapsed or you can pre-close the loan by paying the outstanding amount in a lump sum payment. To know the outstanding amount on your loan account, you need to call our CitiPhone helpline. Online transfer will take 3 working days to reflect in your loan account. In case of a cheque payment, it will be credited to your loan within 4-5 working days, subject to realization of funds. The loan will be pre-closed automatically, post receipt of clear funds. The letter confirming loan closure will be sent within 15 working days from the date of loan closure. If there is no other facility availed on the property financed, then you can collect the original title documents along with the loan clearance certificate on or after 15 days from the date of receipt of your payment. A Citibank officer will contact you and fix an appointment to collect the documents. We request you to visit our branch with a proof bearing your personal identity and that of all co-borrowers on the loan account for collecting the property papers. 1. Login to Citibank Online by using your User ID and IPIN. 2. Click on Home Loan' tab on the top. 3. Click on '+' button to expand/view the Home Loan Accounts. 4. Click on the Home Loan Account link to view the details of the Loan Account. You will be able to view a link “click here to view your Repayment schedule” at the bottom of this page. 5. Click on the link to view the Repayment Schedule for next 6 months. 1. Login to Citibank Online by using your User Name and IPIN. 2. Please click on the link “View loan Certificates” on the left navigator. 3. Place the request under “property documents custody certificate”. 4. The same will be sent to your address maintained with us in 7 working days. Please contact our CitiPhone helpline to place a request for a copy of your loan agreement. The same will be sent to your address maintained with us in 7 working days. Please contact our CitiPhone helpline to place a request for a statement of accounts and this will have all loan related details. The same will be sent to your mailing address registered in the loan account or email id registered with us. Please contact our CitiPhone helpline to register your loan for CitiAlert. Our officer will be glad to assist you. Please contact our CitiPhone helpline to place a request for Credit Information report on the existing loan account. Our officer will be glad to assist you. Home Credit is a unique facility, which combines the advantages of a home loan with the transactional features of a current account. This facility also helps you to save on interest and to repay your loan faster. Home Credit account is a current account linked to your loan. All amounts deposited in the Home Credit account in excess of the threshold amount* (https://www.online.citibank.co.in/soc/soc-pdfs/mortgages.pdf) and subject to a maximum of your outstanding loan is transferred on a daily basis to your loan account to offset the interest being charged on your loan. This amount is always available for withdrawal by you as an overdraft line. The balance maintained in the current account will automatically be swept to the home loan account at the end of every day leaving a minimum threshold (as set by the bank) in the current account. The amount swept will be available in the current account in the form of line amount. The line amount will act as the interest saver in the home loan account as the swept amount reduces the loan outstanding. Interest will be charged in your loan account after considering the amount thus swept to your loan account. Home Credit Vanilla option gives you the option of maintaining liquidity. Interest savings arising out of the Home Credit facility go towards increasing this line, which is always available for withdrawal by you. Every month, an alert will be sent to your registered mobile number on the interest saved in your Home credit account. To apply for top-up, you should have completed 12 months EMI repayment on your existing loan. Please note, sanctioning of top-up is subject to meeting Citi’s credit acceptance parameters. 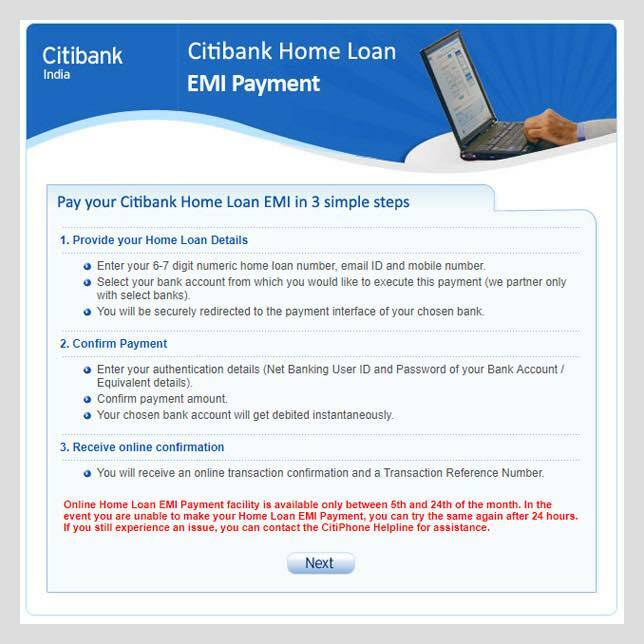 It is easy to apply for Citibank Home loan top up in just 2 steps. ◆ Select Home loan under “Loans” tab. You can also apply for the same by logging in to your Citibank Online account. Step 2: Click “Apply for top-up” and enter the relevant details. You will be provided with a unique Home loan application number. You may contact our CitiPhone helpline to know the status of your application. View the details and confirm. Select 'Transfer to Citibank Account' or 'To other Bank account'. Click 'Add Payee' button. Review the new payee details on the pre – confirmation page, accept the T&Cs and then click 'Confirm'. Click on 'Edit Mat/Int' for the selected deposit for which you want to make changes. 2. Select "Status of existing requests"